The birth of Maison Lavau dates back to 1964, when it was founded by the Lavau family. The Lavau family were already familiar with with wine trade as they moved from St. Emilion in the Right Bank of Bordeaux to Violes to start their own business. Their goal at the time was to be a negociant, producing wine from purchased fruit. Since 2000, the company has been managed by managed by the brothers, Benoit Lavau and Frederic Lavau. 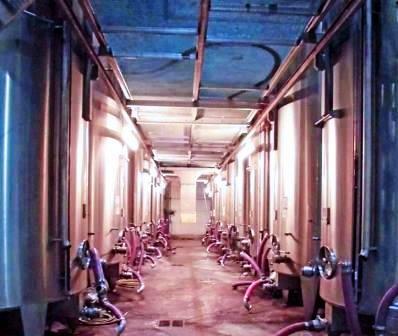 In 2009, Lavau SAS had grown as a company enough that they began selling their wine to other negociants so they could produce and bottle the product as they saw fit. Being one of the largest negociants in the Southern Rhone by that point, they were purchasing fruit from almost 350 different growers! Their output by that time was close to 800,000 cases of wine per year. In 2013, Lavau SAS expanded their company and purchased Chateau Maucoil, creating a new partnership, Groupe Maucoil Lavau, which is co-owned by the Lavau family and the Bonnet family. Maison Lavau produces wine from 25 hectares of vines they own in Chateauneuf du Pape. They also own 17 hectares cultivated in the Cotes du Rhone Villages appellation where they make both red and white wine. In Chateauneuf du Pape, they make 1 red wine. Maison Lavau Chateauneuf du Pape is produced from a blend of 50% Grenache, 40% Syrah and 10% Mourvedre from vines that are on average, 40 years of age. The terroir is sandy soils found in the Baratin vineyard. The grapes are 100% destemmed. The wine is aged in a combination of 50& new, French oak barrels and the remaining 50% of the wine is aged in tank for 12 months before bottling. Vacqueyras, Tavel, Rasteau, Cotes du Rhone, Cotes du Rhone Villages, Ventoux, Valreas and Bagnols sur Ceze. They also sell several well priced, IGP wines. Maison Lavau can be enjoyed on the young side. Young vintages can be popped and poured, or decanted for about 1 hour. This allows the wine to soften and open its perfume. Older vintages might need very little decanting, just enough to remove the sediment. Maison Lavau is usually better with 1-3 years of bottle age. Of course that can vary slightly, depending on the vintage. In the best vintages the wine should be consumed within 2-8 years after the vintage. Maison Lavau is best served at 15.5 degrees Celsius, 60 degrees Fahrenheit. The cool, almost cellar temperature gives the wine more freshness and lift. Maison Lavau is best served with all types of classic meat dishes, veal, pork, beef, lamb, duck, game, roast chicken, roasted, braised, stewed, dishes, sausage, barbecue, grilled meats and cassoulet. Lavau is also good with Asian dishes, hearty fish courses like tuna, mushrooms, cheese, pasta, eggplant and tomatoes. Medium bodied, early drinking wine with a forward, red berry core of fruit. Best to enjoy this young. The wine was produced using 50% Grenache, 40% Syrah and 10% Mourvedre. Medium bodied, easy drinking wine with a forward, red berry core of fruit. Best to enjoy this young. Medium bodied, uncomplicated, easy drinking, fresh, red fruit filled wine that offers great pleasure for near term enjoyment. Garrigue and herbs with a light, short, red berry finish. Sweet and spicy berries, medium bodied and open, the wine finishes with a blend of fresh herbs and peppery cherries. From a blend 50% Grenache, 40% Syrah and 10% Mourvedre, the wine reached 14% alcohol.